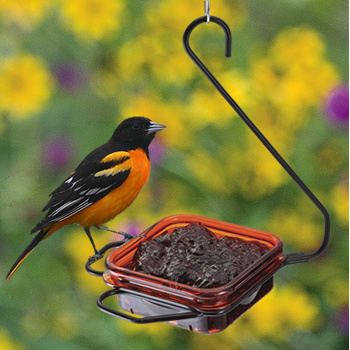 Best oriole bird feeders to attract orioles to your garden. What to feed orioles. And other fun facts about these colourful backyard visitors. As with all other garden birds, the way to attract orioles to your garden is to offer them their favourite foods. In summer, make these bright creatures happy with sugar water nectar in oriole bird feeders. Remember to make sure that your feeder has perches to help the orioles eat. Try not to use insecticides in your garden that would get rid of all the insects. Orioles love insects! Especially during the mating season. Offer the orioles chunks and wedges of fruit on a spike or a tray, they will love you! Bang a nail into a tree and pin half an orange on it for a simple oriole feeding station. Orioles are shy birds, so put oriole feeders away from human activity. Jelly is a favourite food of orioles. Offer them grape jelly in a dish or an empty half orange skin and watch them enjoy themselves. do not use sugar free jellies - orioles need the calories in sugar. Plant nectar producing flowers in your garden to give orioles a natural alternative. Orange flowering shrubs will get them visiting regularly. 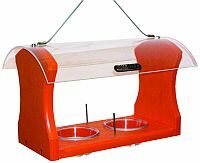 Keep your oriole feeding stations clean. replace nectar and fruit every few days to avoid contamination. Try a variety of fruit and nectar types to tempt these colourful visitors to your garden. The standard hummingbird formula of 1 part sugar to 4 parts water is good for orioles as well. remember that orioles will need nectar feeders with larger ports and perches. Orioles will also be happier with less sweet nectar, so making homemade oriole food with 5:1 or even 6:1 ratio of sugar to water is fine. Commercial oriole nectars use orange dye to help attract the birds, but this is not really necessary as most oriole bird feeders have orange parts that will attract the birds just as easily. Easy to fill wide-mouth jars and two part bases make this very easy to clean. Hang on a hook or from a branch. 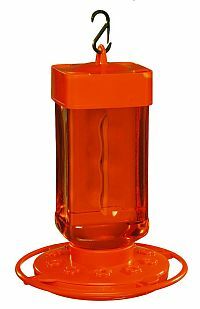 The bright orange color of this oriole feeder attracts the birds. I find this feeder to be very sturdy and long-lasting. The multiple ports allow many orioles to feed together. I love that the hummingbirds also enjoy this feeder. A great oriole feeder with two cups for jelly plus two stainless steel fruit pegs. The clear acrylic top makes for easy viewing. The jelly cups lift out for easy washing. I find it simple to load up and really easy to clean. And I love that it is made from recycled plastic!